Famous entertainer Jimmy Cricket will release his fourth CD on 1 February. Jimmy Cricket – Light & Shade – his second all-musical album – is a mixture of comedy and serious songs, which he has written over the past couple of years. The themes of the songs are a mixture of what you have come to expect from Jimmy Cricket the comedian, with a few added twists and surprises! He recorded Light & Shade with Chris Warsop of Redwine Studios in the West Midlands last summer. Primarily, the CD will be available through Jimmy’s website dedicated to his merchandise – www.jimmycricketshop.co.uk – and at some point in the future it is intended for each track from the album to be made available to download through a pay-per-click facility on this website. The CD will also be available to buy at Jimmy’s live dates, though it will not be sale at High Street stores. I write this from my dressing room at the Charter Theatre in Preston where I am currently appearing in a pantomime production of Snow White and the Seven Dwarfs. We have had some great audiences in Preston and the show has been great fun to do! (There is still time to come along as the show continues until the 3rd of January). Another year has gone by and, after spending some time over Christmas with my family, I will start to look forward to what 2015 will bring. This will be a special year for me as in October I will turn 70! Already there are plans in place on how this milestone will be marked and one of the exciting events will be a special fun run to be arranged at a location within my adopted home town of Rochdale. There are already several interesting touring commitments lined up for 2015. In the early part of the year I will feature in a comedy show called You Must Be Joking, which has several tour dates around Northern Ireland in late January and early February. I am also teaming up with the male vocalist Michael George for a couple of theatre dates in May and I make a welcome return during 2015 to the Warner Leisure Hotels circuit for the first time in several years. 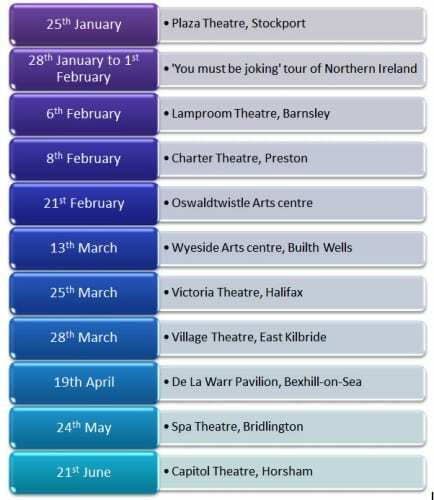 Of course, I will also be touring my own stand-up show throughout the year and venues already lined up for 2015 include: Stockport, Preston, Barnsley, East Kilbride, Horsham, Nelson and Soham. Over the last few weeks I have just finished recording a new comedy music CD called Jimmy Cricket – Light and Shade and this will be available to purchase early in the New Year. Finally, it only remains for me to wish all readers a very happy and peaceful Christmas and a great start to the New Year! Jimmy Cricket’s 2014 Christmas card features a sketch which took place during this year’s Comic Relief event. The card recalls the Only Fools and Horses charity scene starring regular cast members David Jason and Nicholas Lyndhurst, plus former England and Manchester United footballer David Beckham. 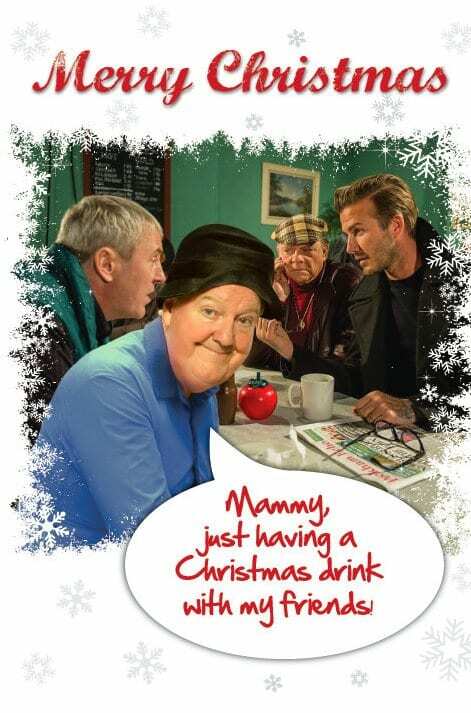 Famous entertainer Jimmy is included on the card as if he is part of the get-together, and even has the chance to reference his ever-present Mammy! The Northern Irish comedian has traditionally created his own customised Christmas card based on a topical photo that has represented in some way an event from the previous 12 months. In 2012 he picked a picture of Usain Bolt and Mo Farah, which was one of the iconic images from the London Olympics. And last year it was a photo associated with the theft of his concrete wellies, which was widely covered in the media.